1C / Medium / 17.00 mm / Medium wide. / Large diameter, medium cup — good for all-around use. 1-1/4C / Medium / 17.00 mm / Medium wide. / Large cup for powerful trumpeters. Compact tone of great carrying power. 1-1/2C / Medium / 17.00 mm / Medium wide, not too sharp. / Large diameter, medium cup — good for all-around use. 3C / Medium / 16.30 mm / Medium wide. / Fairly large cup, good for all-around use. 5A / Very deep / 16.25 mm / Medium wide, rounded inside edge. / A fairly large cup with a dark, full, mellow tone. 5C / Medium / 16.25 mm / Medium wide, well rounded toward the inside and outside, fairly flat. 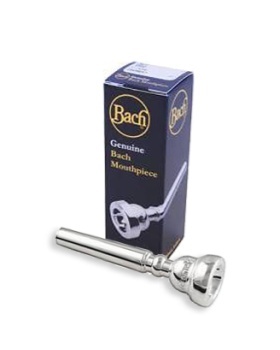 / For players with a strong embouchure who do not like a sharp edge. The tone is lively and rich. 7A / Very deep / 16.20 mm / Medium wide, lowered toward the outside. Med. sharp inside edge. / Warm, melodious, rich tone approaches the quality of a lyric soprano voice. Free blowing.